Prehistoric Life of Pleistocene Arctodus simus Cave Bear by Josef Moravec. (Framed). * Medium: Oil painting 24" x 18". Arctodu simus is also known as the Short-Faced Bear. 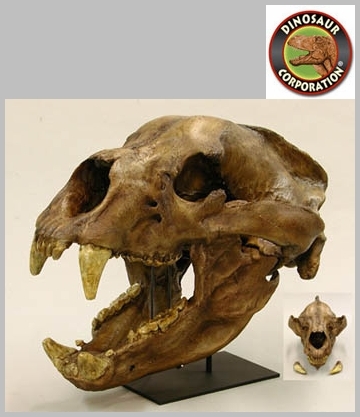 One species, the Giant Short-Faced Bear (Arctodus simus), is the largest bear that ever lived based on fossil finds. It lived in prehistoric North America from about 800,000 to 12,500 years ago. Arctodus simus - Pleistocene Animal, 8.5" x 11"
Arctodus simus - Pleistocene animal - Pleistocene epoch. Printed on premium quality glossy photo paper 8.5" x 11". 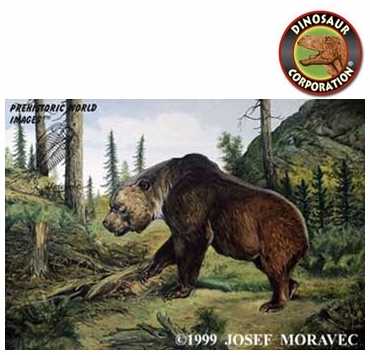 Arctodus simus, Short-Faced Bear, 13" x 19"
Arctodus simus-Short Faced Bear also called Cave Bear, original oil painting by paleoartist Josef Moravec. Ice age mammal is printed on premium photo quality super "B" paper 13" x 19". Arctodus simus, Ice Age Mammal, Framed 17" x 14"
Arctodus simus by Josef Moravec. Framed 14" x 17" in museum quality solid wood frame & double matted in glass.